Gardeners have teamed up with the Coventry Foodbank to supply surplus fruit and vegetables to local people in need. 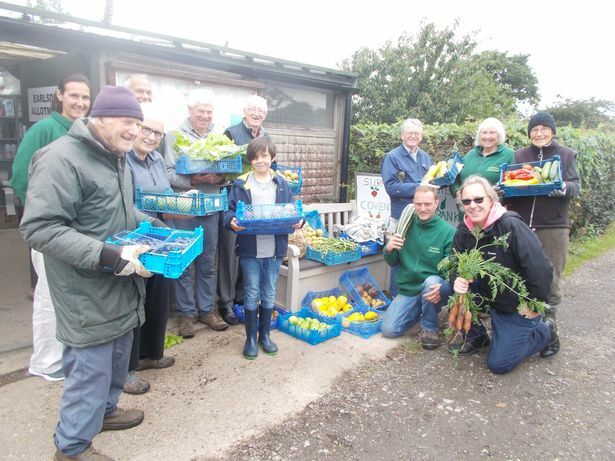 Volunteers from Earlsdon and Beechwood Allotment Societies take fresh produce to the foodbank hub every Monday. The produce then gets delivered to foodbanks across the city , where people in need can get food and essential supplies. The scheme has been running since the start of the main growing season in June, and has seen a variety of fruit and vegetables including potatoes, beetroot, plums and apples shared with those in need. Earlsdon Allotment Society Committee member David Galliers is keen to get other allotment societies in the city on board. He said: “If other societies got involved we could be sending vast amounts of fruit and vegetables to deprived areas across the city. “The allotment was set up in the 1920s for poor workers to grow their own vegetables. Contributors fill up the boot of David’s car with fresh, healthy and mostly organic produce every week, which they pick the night before. With the number of people using foodbanks rising nationally, David’s team were more than happy to help. “When we suggested the idea at the annual meeting members of the society were very enthusiastic. Hugh McNeill, Manager of Coventry Foodbank said: “Coventry Foodbank is one of the largest in the UK. "We give out three days worth of emergency food to people in crisis and feed around 1400 people a month in the city. “When David approached us and asked if we’d be interested in taking some of the produce from the allotment we said we’d be delighted to. The summer holidays are a particularly busy time for foodbanks as some families struggle to feed children who would usually get free school meals. The Trussell Trust, which runs Coventry Foodbank - one of the busiest in the country, said it saw a 17 per cent rise in demand for food during the last summer holidays in the West Midlands. Yes allotment people are generous and nice to hear they are helping the poor. Its a shame the poor dont do an allotment them selves as for people on benefits its half the price per year if they are willimg to clear the allotment which is usual when first starting to see how eagar you are . I think its now about £15.00 per year if on benefits and they would gain experience knowledge from other allotment members perhaps it would encourage them to take a course at college in Horticulture giving them qualification for a job . I had two allotments when I was a one parent on benefits £7.00 per week each in the mid 80s it fed my children and I also my mum and neighbours. The plots just off Allesley Old Rd are, as Melisandre says £15.00 a year. I gave mine up three years ago, not because of my age but because of theft and vandalism. I will not spend time and money just to see my efforts nicked. Tools went missing, suppose those were sold on car boots for a couple of quid. I cannot but wonder why food banks are needed as we are amongst the richest countries in the world. Perhaps the wrong people are grabbing the countries wealth. Thank you Jock Strap yes on the Radford Rd and Three spires Avenue allotments had the same sheds broken into equipment stolen just before I left moving house and area so I understand your anger as the equipment is nt cheap to replace for good spades etc. Under Labour there were food banks but they were to embarrassed to advertise the fact. If they paid people a decent wage instead of giving it the big companys people would be better off but there are those that no matter how much they have in a wage they would wrecklessly spend on drugs etc games iphones and other stuff and dont care about their children which is a shame as it spoils it for the rest that can handle money and not squander it. I was bought up to handle money my mum had 7 children from the 40s to the 60s off one wage from my dads wage working at Jag - Damilar Motor Works Humber then Rootes and Chryslar my mum handled all his wage clothed fed ran a car had holidays had the first tv on the street mum only took part time jobs to buy a gramophone record player or extra bits and bobs classed as luxury then. Then we went into the common market in the 70s food trippled eg a loaf of bread was 1s 10d before we joined the EU not even 10p soon as we went into the EU a loaf of bread was 6shillings 30p in to days money wages and social benefits stayed the same for quite a while after . My council house a two then a 3 bed from the 70s to early 80s was £5.00 per week which encluded the rates (council tax) and water we had a yearly rate rebate now all gone when they split the rates (council tax)and water from the council rent. Boy did we get done big time. Melisandre wrote: Under Labour there were food banks but they were to embarrassed to advertise the fact. Gordon Brown specifically forbade Jobcentre staff from mentioning foodbanks! They are also specifically forbidden from mentioning certain benefits which are available to people in desperate circumstances. If you know about them you can claim them but if you don't know about them they won't tell you they exist. It matters not what political party we have. I stick to what I said above. All partys are the same theres no difference imo one takes over where the other left off same staff same policies once one gets in. I read yesterday Hammond is getting the money prepared to release billions for a no deal Brexit considering they keep preaching there is no money and for us to have cuts to services nurses fire men police so where are all these billions coming from.